I’m finally catching up on some spring and summer beer reviews. This was left over from a gift crate of beer that my co-workers got for me at State Line Liquors when I have home sick with the Shingles back in February. One of my favorite summer beers was Corsendonk Apple White. It was a one year only apple wit from Belgium. I was very excited to see another apple wheat beer. I can’t what to see what this is like. The beer pours a slightly hazy pale copper with golden hues and an off white head. What a unique nose full of apple and cinnamon with a touch of pale malt aromas. I can’t wait to see what this taste like. Man O Man that a unique first sip. Full of apple and spice but light and refreshing. Very interesting! This experience starts out with a touch of pale malt sweetness up font on the tip of the tongue. That is immediately followed by a tingling effervescence over the tongue. The back-end is very easy drinking with an effortless swallow. The finish is nice with pale malt flavors along with apples and cinnamon flavors with citrus notes and light floral hops. The final aftertaste is of lingering spice. This was a little more intense than what I was expecting but I am still really enjoying this experience. I couldn’t drink this everyday but it’s a nice specialty beer. The apple flavors a really nice on this beer and the cinnamon spice on the finish is pretty nice also. 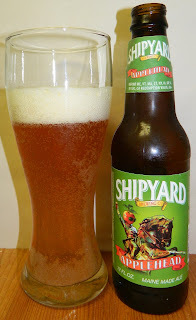 B+ | Shipyard Applehead Ale is a very good tasting Fruit / Vegetable Beer with great real apple flavors and a very refreshing effervescent mouthfeel followed by a nice finish with pale malt flavors, real apple flavor and heavy cinnamon spice on the finish with a touch of floral hops and citrus notes.